Eos Prodromos Outpost. 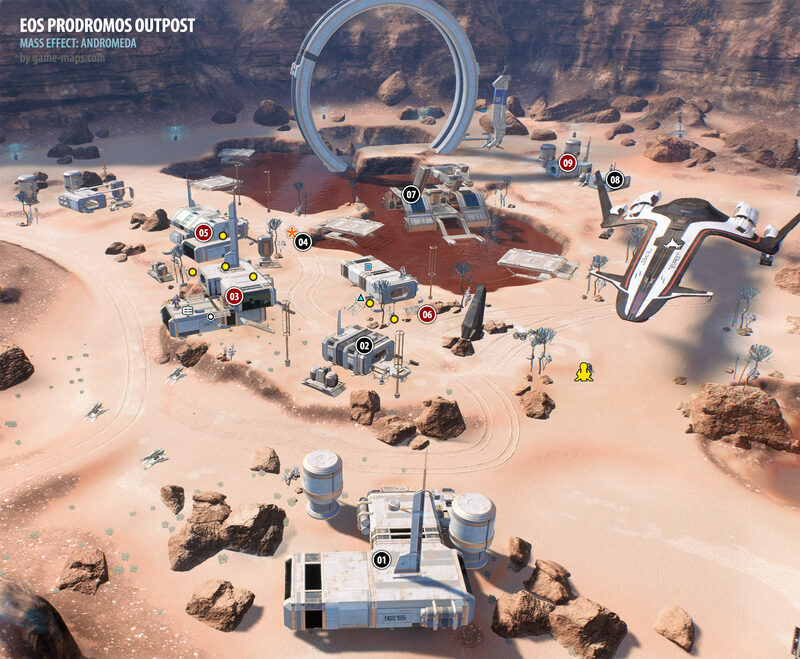 Mass Effect Andromeda Atlas with Maps, Game Guide and Walkthrough. Map contains Quest starters, interesting locations, Codex Entries, Forward Stations, Outposts, Monoliths, Remnant Areas, Bases, Caves, Structures, Point of Interests, Resources and Raw Materials, Enemies. The family of Darket Tiervian, a turian still in Cryo, are asking that she be allowed to join them instead of waiting for a future Cryo block deployment. Prodromos is getting the experts it needs, but morale contributes as much to viability as resources. The Majordomo at Prodromos added the names of Site 1 and Site 2 Casualties to the list of Survivors, and something doesn't add up. There are still people missing from Promise and Resilience. Evidence might be found to explain those still missing at a number of possible emergency muster points. G4 has a high level of radiation and you will be able to get to it in the game when you have the right equipment. You need to gather the necessary materials to craft a chestpiece for your armor at a research Station. Go to 08 Eos Prodromos and develop Pathfinder chestpiece. A work crew from Prodromos has a dangerous plan to try and control the Remnant. They should be stopped before someone is injured. Search Prodromos for clues to where the work crew has gone. Eos is experiencing seismic activity. Altering the tremors with a survey hammer might allow better irrigation for Prodromos. A discovered report indicates that supplies headed for Prodromos have gone missing. Checking the supply drop sites might uncover some information about what's happening. Go to August Bradley Prodromos 04 and speak about Jaam Ama Darav: Friend or Foe? For Life on the Frontier, talk to him.